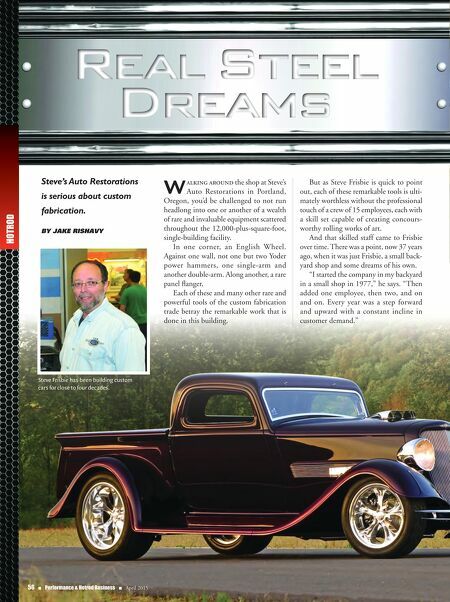 HOTROD Real Steel Dreams Steve's Auto Restorations is serious about custom fabrication. By Jake Rishavy 56 n Performance & Hotrod Business n April 2015 W alking around the shop at Steve's Auto Restorations in Portland, Oregon, you'd be challenged to not run headlong into one or another of a wealth of rare and invaluable equipment scattered throughout the 12,000-plus-square-foot, single-building facility. In one corner, an English Wheel. Against one wall, not one but two Yoder power hammers, one single-arm and another double-arm. Along another, a rare panel flanger. Each of these and many other rare and powerful tools of the custom fabrication trade betray the remarkable work that is done in this building. But as Steve Frisbie is quick to point out, each of these remarkable tools is ulti- mately worthless without the professional touch of a crew of 15 employees, each with a skill set capable of creating concours- worthy rolling works of art. And that skilled staff came to Frisbie over time. There was a point, now 37 years ago, when it was just Frisbie, a small back- yard shop and some dreams of his own. "I started the company in my backyard in a small shop in 1977," he says. "Then added one employee, then two, and on and on. Every year was a step forward and upward with a constant incline in customer demand." 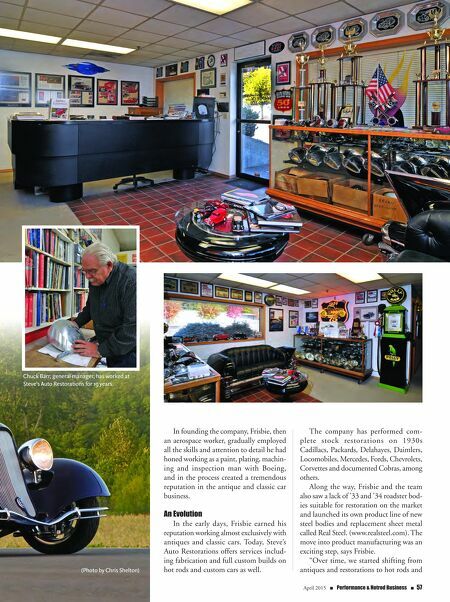 Steve Frisbie has been building custom cars for close to four decades.